It has been quite awhile since my friend Angela won The 400th Comment Contest and I owed her a prize! Since all my crafting supplies are still packed away in boxes, I used the fact that Angela is getting married in September to inspire what her prize would become. I have made these kits before for soon-to-be brides, so it worked out perfectly that Angela made the 400th comment on My Color Coded Life. 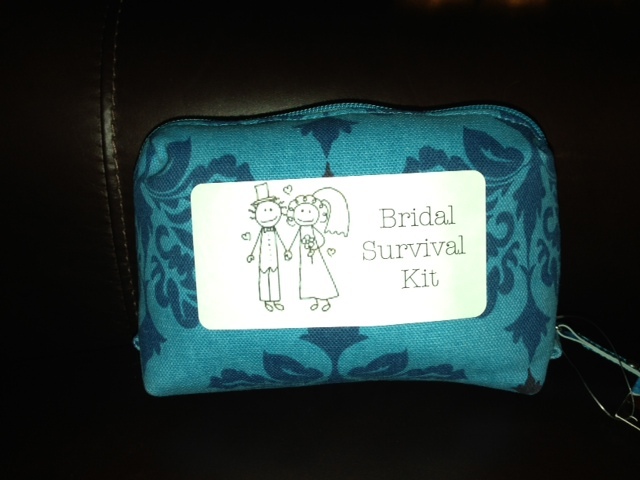 I found everything I needed to make this Bridal Survival Kit at Target. I mean seriously – what CAN’T you find at Target? I bought a small blue make-up bag. I think it’s important that the bag not be too bulky. This is something the Maid-of Honor can just throw in a tote (maybe the one that has the bridal slippers or flats) or the limo and it won’t take up too much room. I only buy GENERIC items that specific brands do not matter. On her wedding day, a bride is going to want the specific products that she uses. 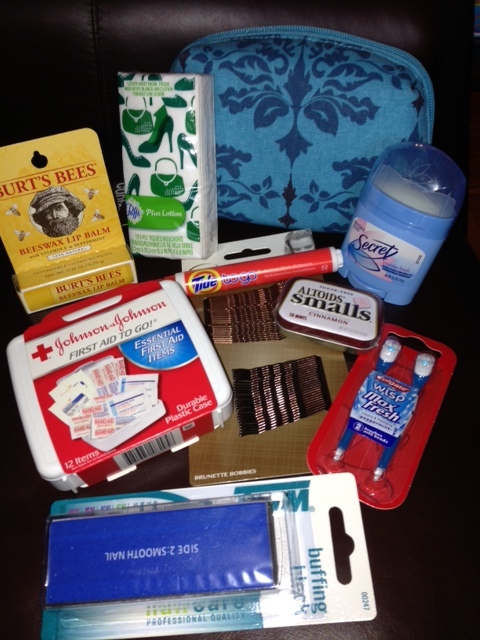 The products I included are ones that it doesn’t matter what specific brand they are. What’s in this kit: tissues, bobby pins, first aid kit, Altoids, Tide-To-Go pen, nail file, Colgate whispers, chapstick and deodorant. I know what you are going to say – deodorant? That is something she will want her own brand of. True, but this small deodorant is for her legs!! What??!! Yes – a little bridal tip – especially if you are getting married in the summer and have a big long dress – put some deodorant on your thighs. Just trust me on this one! 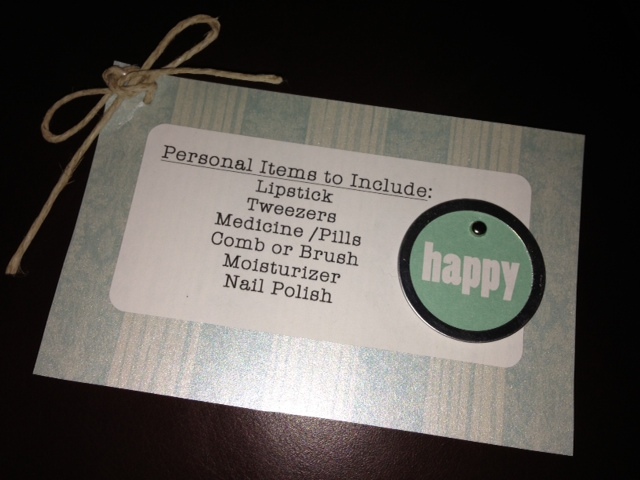 Here is a note I attached to the gift reminding the bride of her own items that she should add to this kit. I also included a small happy sign – after all the planning and perhaps stress, hopefully the bride will relax, have a fun day, and BE HAPPY! I put the prize in a yellow bag which I knew was part of Angela’s wedding color scheme. Thanks to everyone for reading. Want to win a fun prize? Well you have to start making comments on my blog! Here is to the next 100 comments and The 500th Comment Contest! 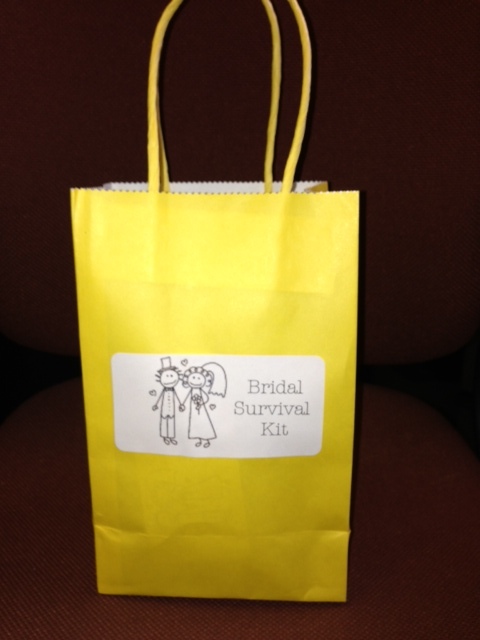 Maureen, thank you so much for the bridal survival kit – I love it! Not only will in come in handy on the big day, but it really made my day to find it on my desk this morning. All of the little touches you added made it so personalized. My sister (MOH) will definitely appreciate this too!